This tiny house on wheels has been created by Bulgarian designer Hristina Hristova. The house, dubbed Koleliba, is used by Hristina and her family as a holiday home, allowing them to avoid the high prices associated with resorts, and the crowds that often come with them. Like many people who choose to opt for a tiny house, cost is usually a major factor. For Hristina, the cost of buying land and also building a retreat seemed “distant and impossible”. However, their budget did allow for a tiny house which could simply be towed to a site. From Hristina: “The idea for this tiny vacation house was born out of our desire to stay away from the crowds and the concrete of the five stars beach resorts and spend time somewhere calmer and closer to nature instead.” The size of their house was limited by local road regulations. 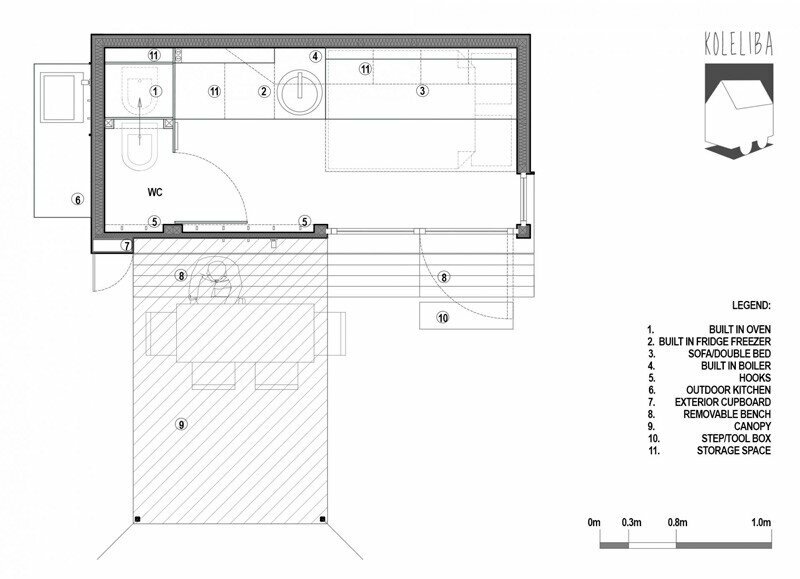 All told it contains a footprint of just 97 square feet (9 square meters). The greatest challenge of any tiny house build is usually the limited amount of space you have. Here, they’ve gone with a ridge height of 7.8 feet (2.4 meters) and incorporated a large set of swinging patio doors. The light from the windows helps prevent the space from becoming claustrophobic, and provides great views out over the surrounding landscape. The interior contains a transformable sofa-bed with storage underneath and above. The kitchen is a small and simple set up, with the wall units extending into the living area, and a built-in freezer and oven. Beyond the kitchen there’s a separate bathroom. For more tiny houses check out Studio Go, a tiny prefabricated house by Noem in Barcelona. Or, this tiny house called the Escape Traveler that can sleep up to 6 people. See all tiny houses.